Simulating the earth. experimental geochemistry. Holloway J. 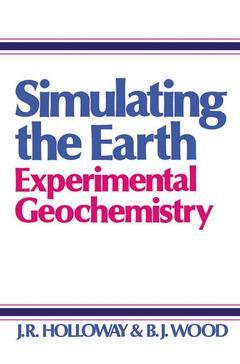 Add to cart the livre of Holloway J.
Simulating the earth. experimental geochemistry. This is a book about the why and how of doing experiments on rocks, minerals, magmas, and fluids. It could have as logically been subtitled "Experimental petrology" as "Experimental geochemistry," but we chose geochemistry to emphasize the broad and overlapping nature of current experimental work. We have tried to aim the book at a general readership which we hope will include advanced undergraduate students, graduate students, and anyone else interested in learning something about experimental petrology. Although we hope there will be something of interest for the practicing experimentalist, our aim is at the non-experimentalist interested in learning why experiments are useful, what kind of experiments can be done, and what some of the major problems and limitations are and how they can best be avoided. The result of a journey through this book should be an ability to evaluate published experimental work critically and a knowledge of the kinds of problems an experimentalist might be able to help solve. Some details of experimental technique are included in the Appendix for those readers who want to "get their hands dirty. " Indeed, one of our main incentives for writing this book was to try to encourage more petrologists and geochemists to become experimentalists. In our pedagogical approach we have chosen to discuss a small number of case histories as illustrations of principles and techniques. We have tried to select studies we regard as well executed. 1 The scope.- 1.1 The questions.- 1.2 Experimental philosophy.- 1.3 Conclusions.- 2 The good experiment.- 2.1 Introduction.- 2.2 The conditions.- 2.3 What goes in: starting materials.- 2.4 Measurement imperfections.- 2.5 What comes out: analytical techniques.- 2.6 Conclusions.- 3 The machines.- 3.1 Introduction.- 3.2 Machines for “easy” conditions (atmospheric pressure).- 3.3 Machines for near-surface hydrothermal conditions.- 3.4 Moderate pressure: crust-upper-mantle machines.- 3.5 Ultra-pressure machines.- 3.6 Machines for thermodynamic measurements.- 3.7 Conclusions.- 4 Metamorphic experiments on solid-solid reactions.- 4.1 Introduction.- 4.2 Reactions involving pure phases.- 4.3 Displaced equilibria and activity measurements.- 4.4 Displaced equilibria with two solid solutions.- 4.5 Coexisting solid solutions.- 4.6 Putting it all together.- 5 Metamorphic experiments on solid-fluid reactions.- 5.1 Introduction.- 5.2 Fluid generation and control.- 5.3 Devolatilization experiments.- 5.4 Mineral-fluid interactions.- 6 Just fluids.- 6.1 Objectives.- 6.2 Volumetric measurements: P-V-T.- 6.3 Speciation from solubility.- 6.4 Speciation from spectroscopy.- 6.5 Speciation from electrical conductivity.- 6.6 Conclusions.- 7 Igneous experiments on melts and crystals.- 7.1 Introduction.- 7.2 Atmospheric pressure experiments.- 7.3 Crustal magmas.- 7.4 Experiments at mantle pressures.- 7.5 Trace element behavior.- 7.6 Conclusions.- 8 Igneous experiments on melts and fluids.- 8.1 Introduction.- 8.2 Volatile solubilities in melts.- 8.3 Spectroscopic measurements and speciation methods.- 8.4 Distribution of elements between melts and fluids.- 8.5 Conclusions.- 9 Physical properties of Earth materials.- 9.1 Introduction.- 9.2 Viscosity of silicate melts.- 9.3 Diffusion.- 9.4 Crystal growth.- 9.5 Elastic properties.- 9.6 Conclusions.- A.1 Measuring temperature.- A.2 Measuring and generating pressure.- A.3 Controlling oxygen fugacity.- A.4 Materials.- A.5 Preparation of starting materials.- Bibliography/References.